Drivers who are arrested for DUI in California are usually given the option of taking either a breath or blood test. Because California is an “implied consent” state, drivers who refuse chemical testing can still be charged with DUI and would face a yearlong driver’s license suspension without the ability to get a restricted license. 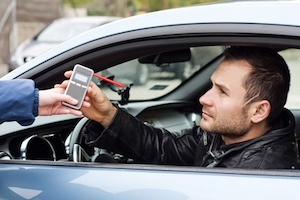 Those arrested for DUI often want to know what is meant by the term “implied consent” and how it affects DUI criminal cases and administrative driver’s license suspensions. In California, all drivers on the road are presumed to have given their “implied consent” to chemical testing if arrested on suspicion of driving under the influence. This applies to all drivers on the road in California and not just those who carry California driver’s licenses. Implied consent allows the State to impose both criminal and administrative penalties on drivers who subsequently refuse testing when lawfully requested. What Tests Can a Driver Refuse? When a driver is pulled over for DUI, the officer will conduct a DUI investigation to determine whether or not there is probable cause to arrest the driver. The officer will interview and observe the driver and will ask the driver to participate in a series of field sobriety tests designed to test the driver’s balance, coordination and ability to remember and follow instructions. The officer will also ask the driver to take a breath test on the officer’s portable preliminary alcohol sensor (“PAS”) device. Drivers who are under the age of 21 or who are already on probation for DUI must take the PAS test when requested. All other drivers can lawfully refuse the PAS test without penalty. Implied Consent only applies to drivers who are lawfully arrested for DUI. If the officer has probable cause to believe that a driver is under the influence of drugs or alcohol, he or she will be arrested and typically taken to the police station. If the driver is suspected of driving under the influence of alcohol, the officer will give the driver the option of taking a breath test on a Breathalyzer machine or a blood test. The officer is required to read an admonition to the driver describing both the breath and blood testing options and informing the driver that refusal would result in criminal charges and a yearlong driver’s license suspension. If the driver refuses one test, the other testing option must be provided. For drivers suspected of driving under the influence of drugs, the officer may require a blood draw as there is no breath test that can measure for drugs. Drivers who refuse to take a chemical test will still be charged with DUI in most cases. The driver will not be charged with driving with a BAC over 0.08 percent or higher in violation of California Vehicle Code Section 23152(b) VC because his or her BAC would be not be known. However, the driver can still be charged with driving under the influence pursuant to California Vehicle Code Section 23152(a) VC as well as the refusal allegation. The refusal will add mandatory jail time to any underlying sentence. Even drivers who tested on the officer’s PAS device in the field but later refused chemical testing can still be charged with DUI refusal. In addition, the DMV will issue a yearlong driver’s license suspension, during which the driver would not be eligible for a restricted license. If you have been arrested for DUI, it is critical that you discuss your case with a respected DUI attorney immediately. Michael Kraut is a former Deputy District Attorney with over 14 years of prosecutorial experience who works hard to ensure his clients receive the most comprehensive defense possible, both in court and before the DMV. For more information about implied consent, and to schedule your free consultation, Mr. Kraut can be reached 24/7 at 888-334-6344 or 323-464-6453.